Karelin, G.S. (1841) Bulletin de la Société Impériale des Naturalistes de Moscou 14: 15. Govaerts, R. et al. 2014. Perovskia in World Checklist of Selected Plant Families. The Board of Trustees of the Royal Botanic Gardens, Kew. Published on the internet. Accessed: 2014 July 4. Tropicos.org 2014. Perovskia . Missouri Botanical Garden. Published on the internet. Accessed: 2014 July 4.
International Plant Names Index. 2014. Perovskia. Published online. Accessed July 4 2014. 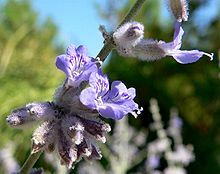 For more multimedia, look at Perovskia on Wikimedia Commons. This page was last edited on 8 February 2019, at 06:11.